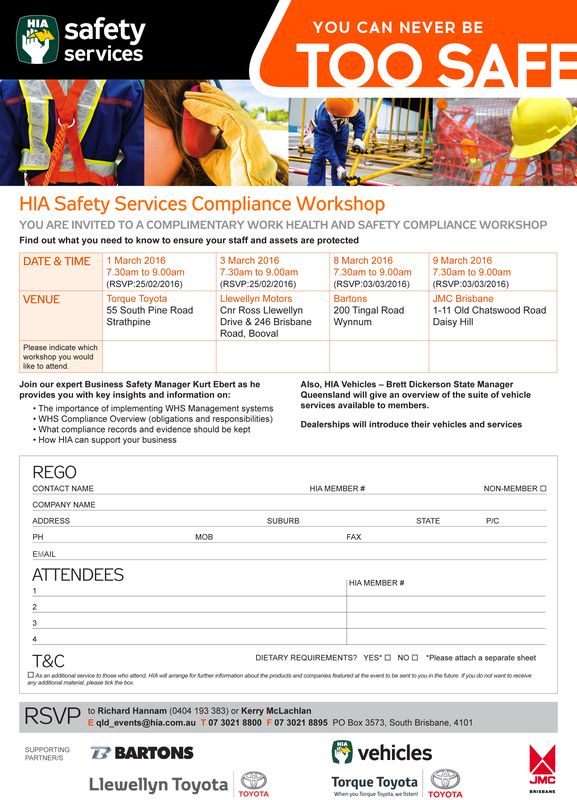 HIA Work Health And Safety Compliance Workshop. As the only national industry association for Australian building professionals, they represent the interests of the housing industry at regional and national levels. HIA’s extensive membership program supports residential builders, trade contractors, developers, design professionals, kitchen and bathroom specialists, manufacturers and suppliers. At Torque Toyota, we are proud to work hand in hand with a powerful association supporting the Australian home building industry for more than 60 years. On Tuesday 1st of March, Torque Toyota will host HIA’s Work Health and Safety Compliance Workshop at our Strathpine dealership. Feel free to join our Expert Business Safety Manager Kurt Ebert as he provides you with key insights and information on how to keep your business safe and compliant. We will also present our All- New Hilux as well as our extensive range of accessories. To take part in the workshop fill out the following form and RSVP as soon as possible.